2 to 3 Day Standard Turnaround with Express One Day Service also available. We sharpen all brands and all types of cutting knives, notcher knives and miter knives. Your knives will come out sharpened just like new! When your knives begin to show signs of wear and become dull, let us bring them back to life! We have the experience and technology to not only offer you precisely re-sharpened edges, but we can get your tools turned aroudn the same day when necessary. No matter what automated bender you have, all tooling requires re-sharpening. Failure to follow a regular maintenance schedule and avoiding signs of dull tools will result in more breakage on the tools and leave a larger burr on the rule. 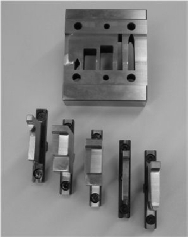 We have the experience and expertise to precisely re-sharpen your bender tooling to “as good as new” condition – no matter what bender you have! Get your machine back into production quicker with our Express Service for automated bender tooling. Advance notice is required for one-day service. Call our Re-Sharpening Department at 1.800.553.777 to schedule an appointment. With the technical engineering team at AmeriKen, the most intricate cutout shapes imaginable are easily achieved. When you entrust AmeriKen with your tooling requirements, one of the many standard services you can expect is unlimited consultation with our engineering staff. As a result, some of the benefits our customers have realized are reduced cost per cut, decreased setup time, automatic stripping, and increased tool life.